Rebel Rebel, the florists behind the Big Brother Eye and Kelway's award-winning Chelsea garden, are devotees of British-grown flowers. 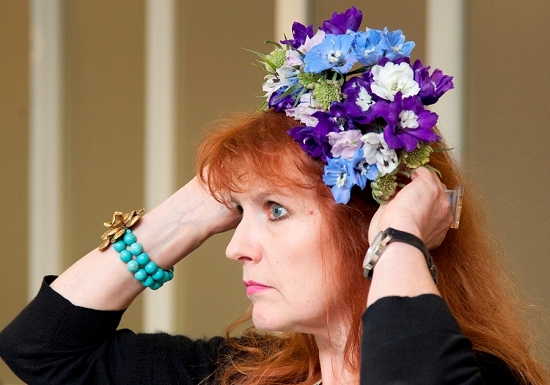 "Just on their own en masse, they are incredibly effective," enthuses Mairead. 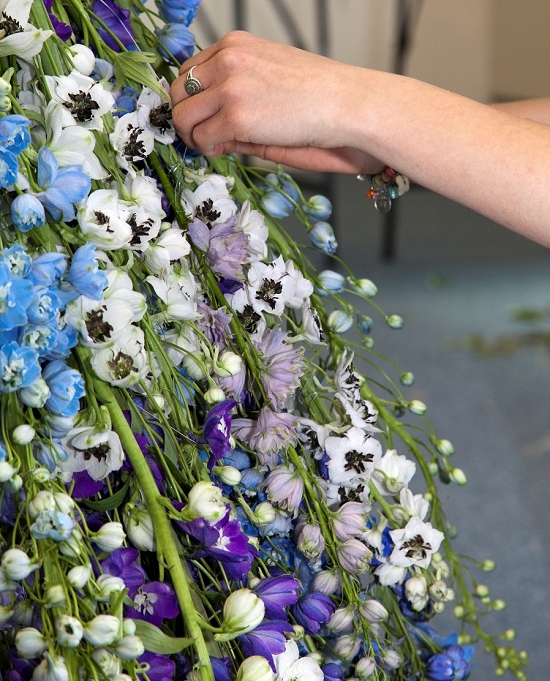 "A mass of the blue-bee delphiniums is stunning in a vase or window boxes." 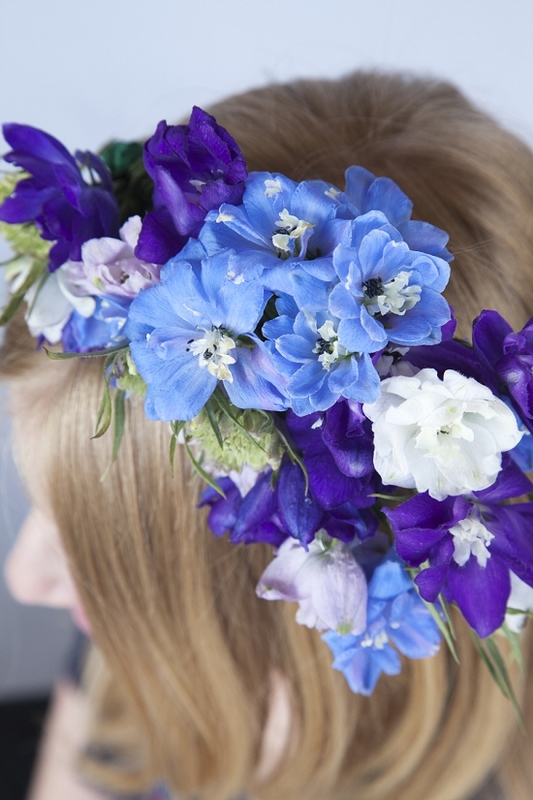 "Delphiniums come in such a fabulous range of colours from rich, deep blue to soft, baby blue, hot pinks, blush pinks, pure white and with stunning markings," says Athena. 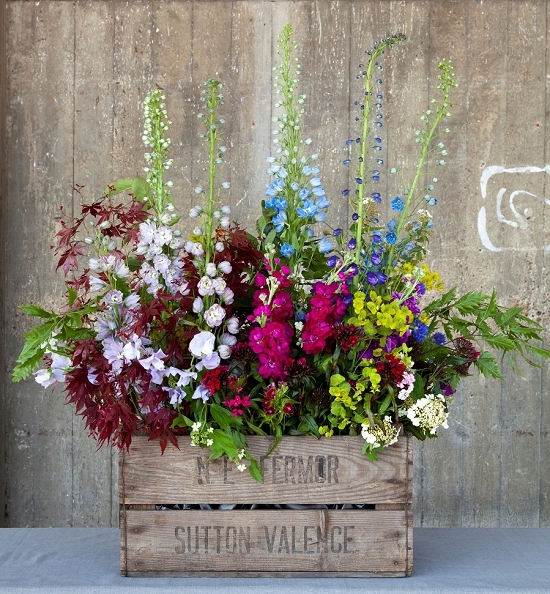 "We used delphiniums in the display we created for Kelways at Chelsea this year. We use them in big urns in a classic delphiniums with hydrangeas mix. 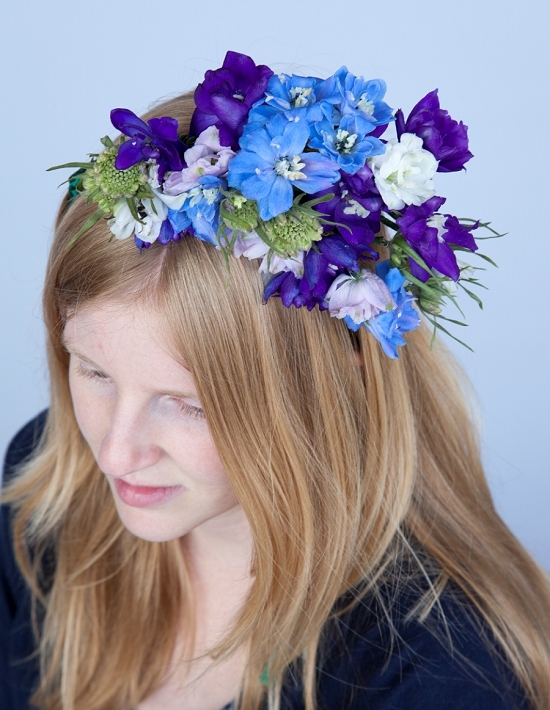 They look great in the hand-ties we create in the shop, and you can use the individual flowers too in more intricate work." 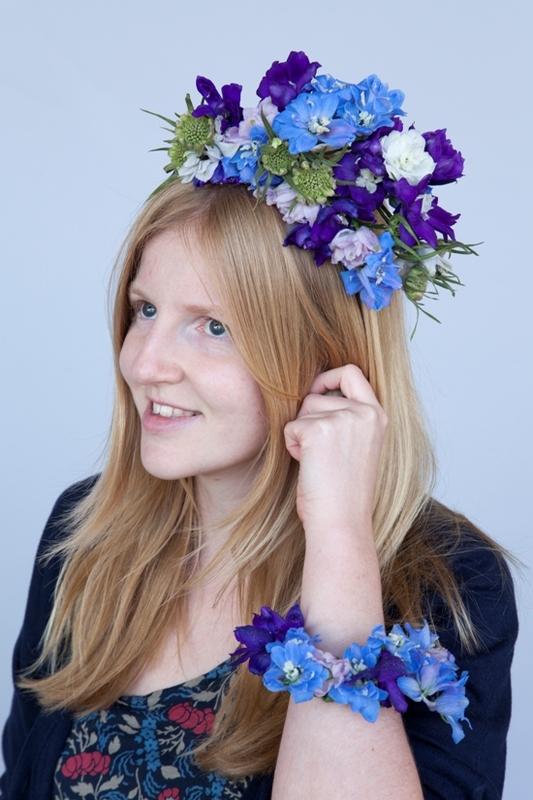 Rebel Rebel illustrated the colour hues and beauty of the individual delphiniums flowers to the full in this stunning headdress and bracelet, as modelled by Athena Duncan and CGMA's Kathryn Holden. 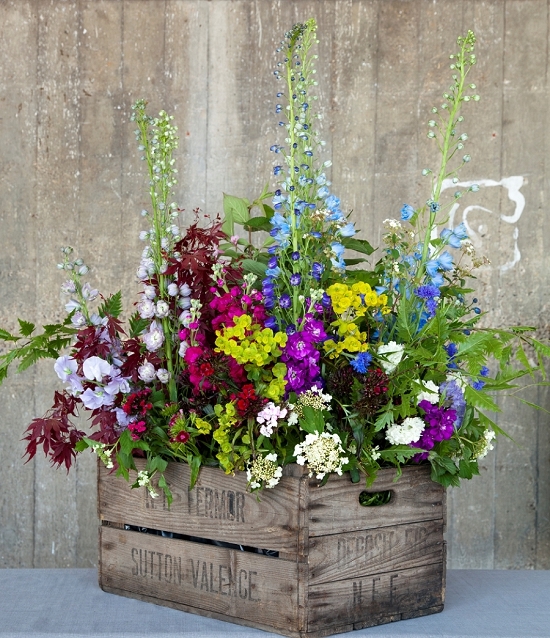 The wonderfully talented Gus of Rebel Rebel took delphiniums as his focus flower and combined them in this gloriously riotous and naturalistic display in a vintage wooden crate. Perfect for a summer party, deep window or mantelpiece, Gus's design blends delphiniums with viburnum, stocks, euphorbia, sweet williams and British-grown foliages. 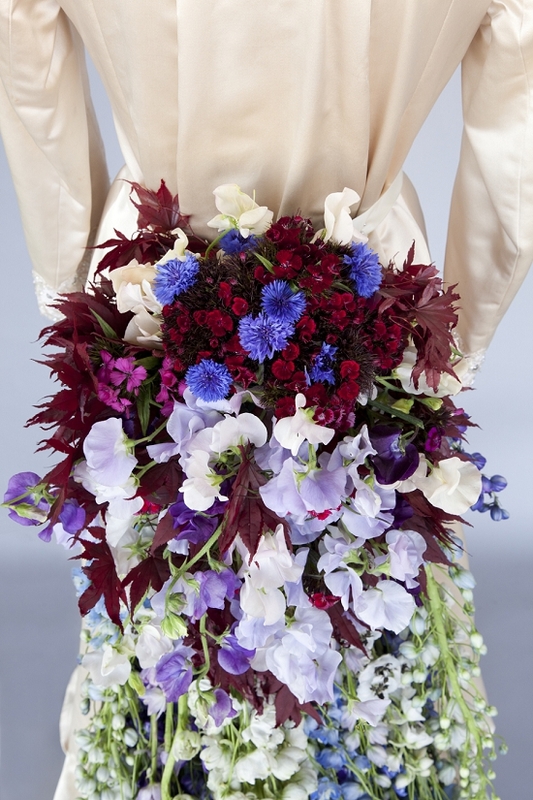 Against a cream vintage bridal gown, Rebel Rebel created a magnificent train of delphiniums topped by a bustle of cornflowers, sweet peas, sweet Williams and ruby red acer leaves such that the train resembled a peacock's tail of feathers. 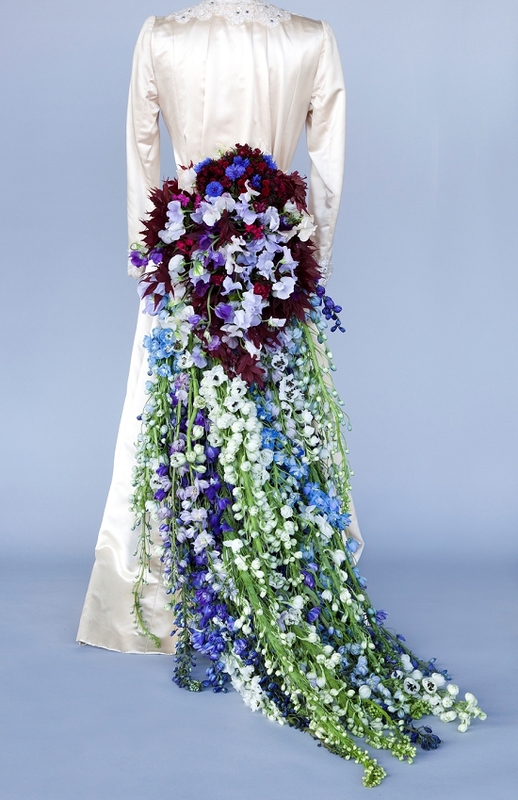 "We wondered whether, instead of holding flowers in her hand, the flowers could be incorporated into a bride's dress, and loose petals set to leave a romantic trail of petals as she walked down the aisle."